The holiday season is upon us, and in my little world, that means it’s time to sew some gifts! 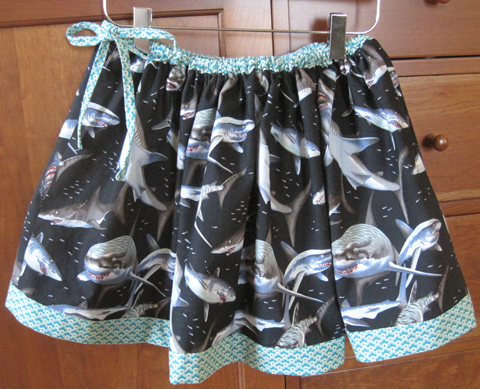 As I mentioned last time, I finished a skirt for my niece Stella using some shark fabric. 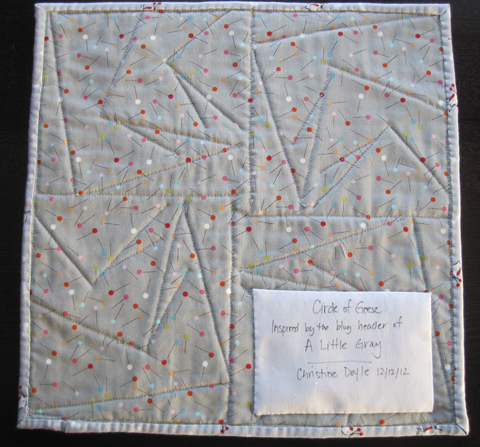 The next gift to be sewn was for the Cincinnati Modern Quilt Guild’s gift exchange. In November we were given the name of a guild member to make a gift for. I was given the name of Jessica Rider. That’s when the panic set in. 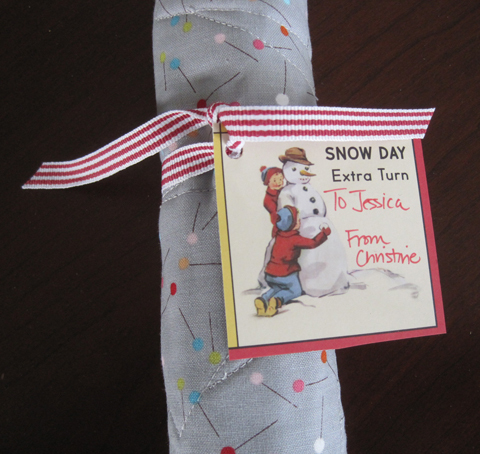 Jessica is a very talented sewist and blogger, whose blog, A Little Gray, is one of my favorites. And it’s the only sewing blog that I read and then find myself saying to Greg, “Honey, you’ve got to see this!” Jessica draws some of her sewing inspiration from the movies and television shows she loves. In fact, this holiday season she did a whole series of projects inspired by Christmas shows and movies. And the scorpion jacket she made for her son inspired by the movie Drive is simply one of the coolest things I’ve ever seen. On the slip of paper with the guild member’s name, we also wrote hints as to the types of things we like. Jessica wrote, “Gray paired with bright colors.” A very helpful hint, really. Except, as it turns out, I’m no good working with grays. I actually have to take my hat off to those quilters who do use a lot of gray. Maybe it’s the type of gray fabric I buy, but the gray always seems too red. Or too yellow. Or too blue for what I’m making. After a few attempts at projects that just didn’t work out, I finally got an idea on the Sunday night before the Wednesday meeting. I was trolling Jessica’s blog, looking for ideas, when I noticed her blog header. It looked a lot like flying geese. Extended a bit further, like the circle of geese paper-piecing pattern I recently had fun with. 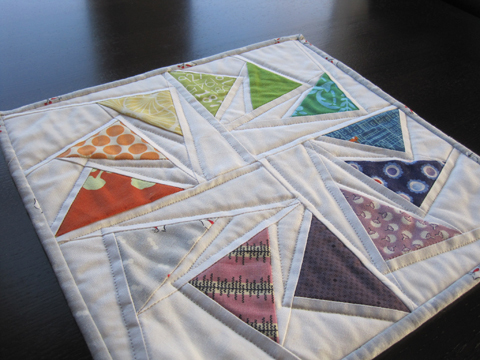 So I made a circle of geese for Jessica, picking up the colors of triangles on her blog header. It was a lot of fun going through my stash and matching up prints to the solid colors in her header. 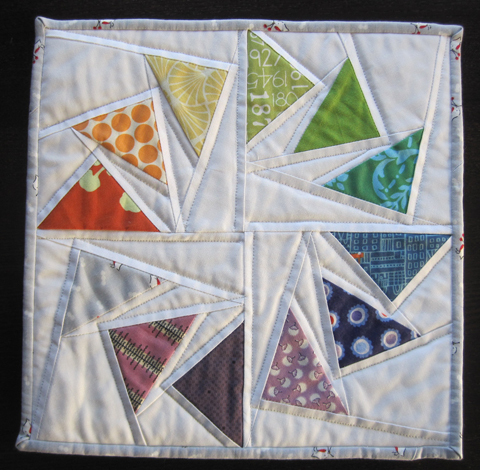 And it wasn’t until I was about to start sewing, that I noticed the tiny gray triangle at the very end of the lineup on Jessica’s blog. After a few adjustments, the lineup of fabrics was set. I did use one of my troublesome grays on the back—no matching required. And I went with a light gray binding to mimic the words in her header. I hit my scrapbook stash ribbon and tag, and the gift was done with 3 hours to spare before the meeting. No worries. I received a gift in the exchange, too, of course. As my hint, I said that I liked Amy Butler and Joel Dewberry fabrics. 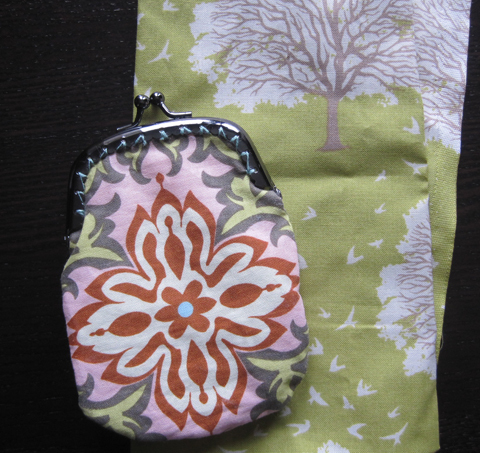 The lovely Christy Meyer took that to heart and give me this coin purse she’d made and a cut of fabric. A perfect gift for me! 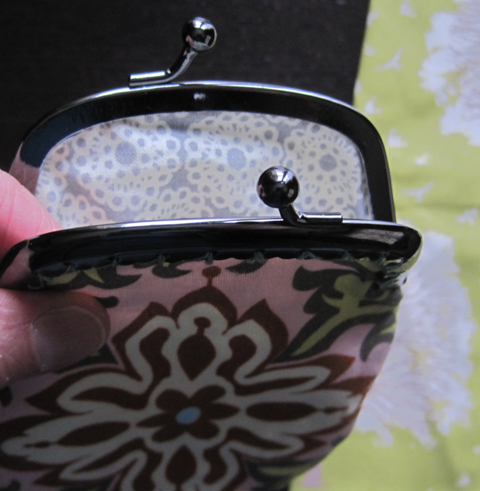 And now I’m even more intrigued by the coin purse and purse hardware I’ve been seeing around. But for now, back to the holiday sewing! When last I asked my four-year-old niece, Stella, her favorite colors were pink and blue. Her favorite food was fruit cocktail. And her favorite animal? Sharks. Or as she said it, shawks. As an aunt, I feel it my duty to only encourage things like the love of sharks and fruit cocktail. Not that she needs much encouragement in the area of sharks. She has shark books that she asks her mom to read to her each night. The shark books need to leave the room in order for her to sleep, of course, but she is only four. And she watched all the Shark Week shows her mom recorded for her. Even the shark autopsy show that her mom would have preferred to fast-forward through. 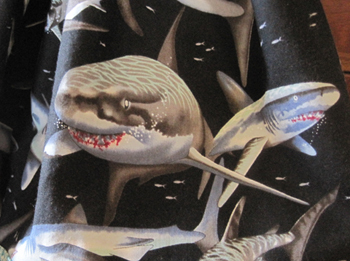 So when I happened upon this Alexander Henry shark fabric at The City Quilter in New York, I couldn’t help but think of my sweet Stella. I have to admit, the fabric is a bit graphic. I’m not sure she’ll be able to wear it to school. And the rendering is also not entirely accurate, according to my in-home shark expert. So the skirt should not be considered a learning tool. But as a fun, full play skirt, I think it works just fine. I followed the Twirly Skirt tutorial from the House on Hill Road blog. The tutorial was very easy to follow. 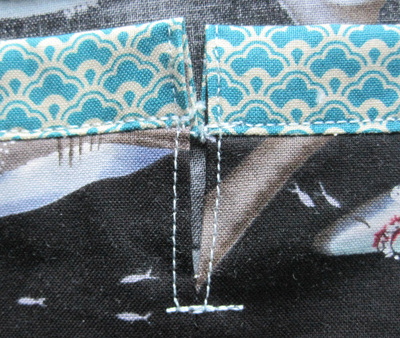 And I really liked that the pattern called for an opening in the side in which to slide the elastic (and the tie). Since I don’t know Stella’s exact waist size, I guessed based on this handy chart for children’s clothes sizes I found from Butterick. But if it turns out I guessed wrong come Christmas time, it’ll be super easy to get at the elastic to make it smaller or to insert a new piece if it needs to be bigger. I did want to get one more thing for the girlie, so last night I picked up some fairy lacing cards for her, too. 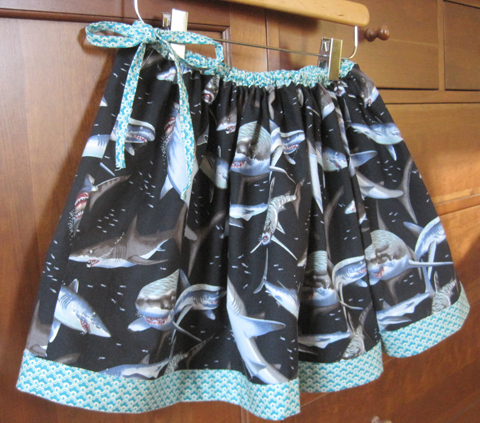 So fairy lacing cards and a shark skirt—merry Christmas, sweet Stella! The week of Thanksgiving, my husband and I got the chance to hang out in New York City. It was only my second time there, and the first time was for work, so I soaked in all I could. In my first blog post about the trip, I shared some of the fabric stores we went to. In this one, I’ll share some of the sights that inspired me. 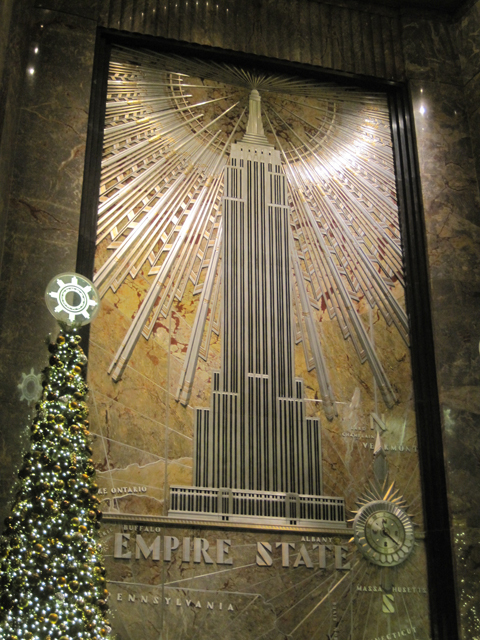 One of my favorite places that we went was the Empire State Building. 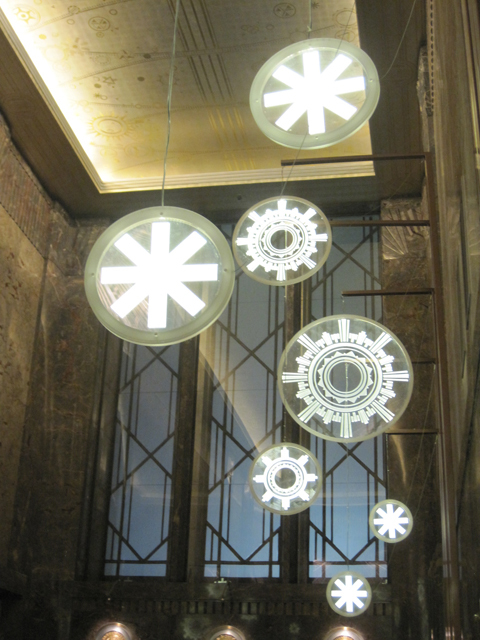 I love art deco architecture, and this building was full of it—right down to their holiday decorations. 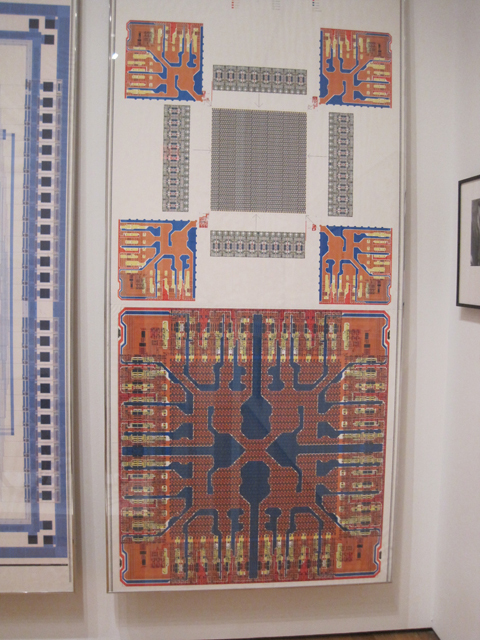 Another big-deal stop was the Museum of Modern Art (MoMA). We got there right when it opened, so we were in with quite a large crowd. But my favorite exhibitions weren’t too packed. 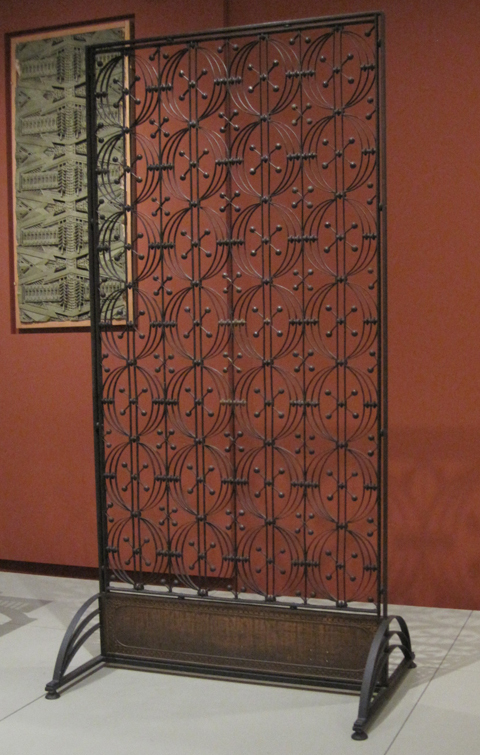 The first one that caught my eye was Shaping Modernity 1880–1980. Under that umbrella were three parts: The International New Art 1880–1918; Metal and Glass 1920s–1950s; and Out of the Box: Italy 1960s–1980s. 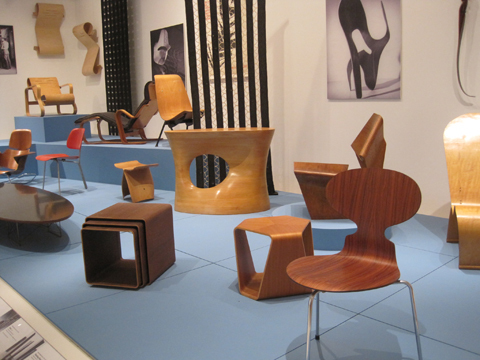 Plywood: Material, Process, Form. Curvy plywood stuff! Love. Of course, we made our way through the paintings and sculpture at MoMA, too. My favorite thing to do when I see a Van Gogh painting is to study the brushstrokes in the thick paint. That’s slightly tough to do when there are two guards flanking a painting and a mob in front of it, but I got to see some of the strokes. 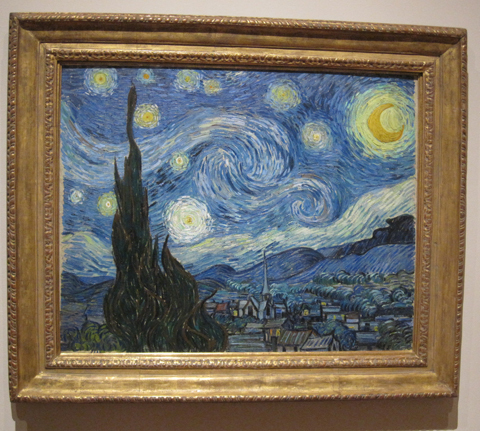 And just seeing Starry Night in real life was pretty cool. Oh, and The Scream? Um, kind of lame, really. 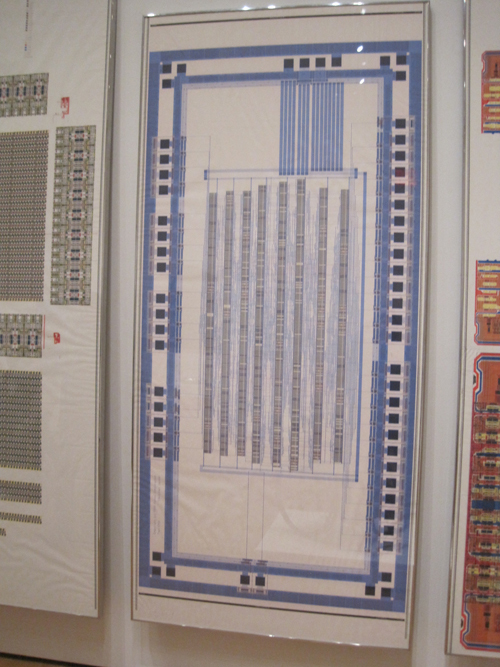 The quilter in me was intrigued by the display of computer schematics by artist’s like AT&T Bell Laboratories and Hewlett-Packard Company. 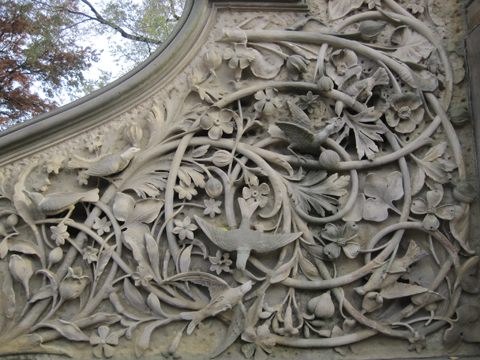 In Central Park, I loved the carvings on this stairway. 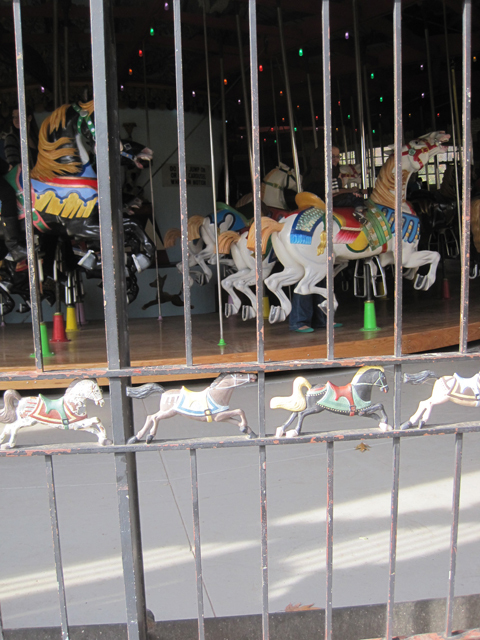 I always have to check out the animals on a carousel–these are in Central Park. 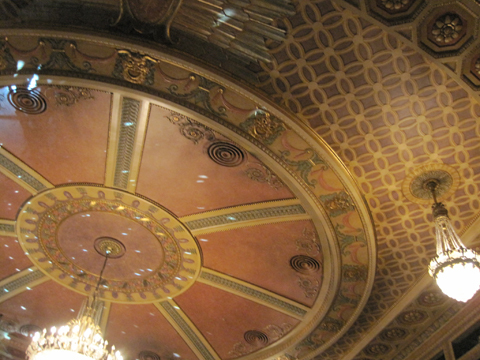 And when you’re in a Broadway theater, don’t forget to look up. This from the Eugene O’Neill Theatre where we were fortunate enough to see Book of Mormon.